Not Another War, Mr. President! Nothing, but nothing, is going to get in the way of this administration’s path to war with Iran. This was brought home in a dramatic way when the Brazilians and the Turks announced Iran had agreed to implement the nuclear exchange deal proposed by the US some seven months ago: the Iranians agreed to turn over most of their fissionable material in exchange for fuel rods and technical assistance that would enable them to produce medical-grade materials. Peace seemed to be breaking out all over – but not if the US government and its allies on the UN Security Council could help it. They refused to take yes for an answer, and promptly announced they were proceeding with the sanctions campaign. Last time we went around this bend, a combination of hardliner opposition within Iran, and the War Party’s efforts in the US and Western Europe, effectively took the nuclear exchange deal off the agenda. No one expected the Brazilians and the Turks to put it back on – and, this time, it was the Supreme Leader, the Ayatollah Khamenei, bypassing hard-line President Mahmoud Ahmadinejad, who gave the agreement his imprimatur. 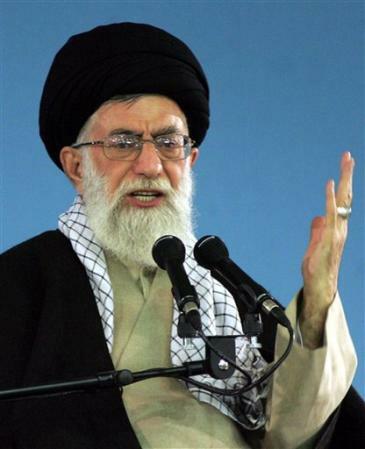 Khamenei, not Ahmadinejad – as US propaganda would have it – is in charge of nuclear policy, as well as being the supreme religious authority. The tripartite pact put the hellbent-on-war Americans, and their British and French compatriots, in a panic. Hillary Clinton couldn’t keep the petulant, hectoring tone out of her announcement that the US and its allies were going ahead with sanctions anyway: “We have reached agreement on a strong draft with the cooperation with both Russia and China,” which will serve “as convincing an answer to the activities in Tehran over the last few days as any we can provide,” she hissed in a Senate hearing on the START negotiations Tuesday morning. The War Party’s pet policy wonks, and Israel’s amen corner in Congress (i.e. everybody but Ron Paul), immediately took up the cry that it’s not enough, it’s a trick, the Iranians could still manage to – somehow – launch a “nuclear breakout” with the remaining enriched fuel. The Iranians didn’t help matters when they announced they would continue to enrich uranium up to 20 percent, but this still wouldn’t allow them to produce a nuclear weapon. That, however, is a technical detail, the explanation of which is going to make most peoples’ eyes glaze over. Suffice to say here that weapons-grade and “highly enriched” uranium are two separate things: in order to qualify as the former, the stuff has to be enriched beyond 90 percent. Iran’s enrichment facilities at Natanz are operating under the watchful eye of the International Atomic Energy Agency (IAEA): any attempt to create weapons grade nuclear materials would be immediately detected. Iran has made a good faith attempt to create the conditions necessary for a comprehensive settlement: instead of rejecting it outright, and moving to impose draconian economic sanctions, the US should stop making itself look like a bully bent on a beating and agree to what was, after all, its own proposal. We look and act like madmen in front of the world – but that, of course, doesn’t enter into the War Party’s calculations. They have their own interests, as opposed to the country’s, at heart. This is all about domestic politics, and competing factions with the Obama administration. The realist faction, which generated the original uranium-for-fuel-rods proposal, has been trumped by the hawkish Hillary. She has cut them off at the pass, stepped on the brakes, and reversed course: not only announcing the new sanctions, but also claiming both Russia and China are on board. Not in Hillary Clinton’s world, however. Nor in Obama’s, as many progressives and leftists are beginning to discover to their deeply felt sorrow. US intransigence in the face of the Iranians’ clear desire to reach a settlement should shatter any remaining illusions about the Obama administration on the left side of the political spectrum. Recent events are rapidly separating the wheat from the chaff: those who oppose interventionism and bullying in principle, and those who are being bought off with pork, perks, and power. Politically, the Obama administration will find the growing conflict with Iran quite useful. With the economy on the edge of complete meltdown, and in the face of a rising populist opposition bubbling up from the grassroots, the sudden discovery of an overseas enemy is a godsend to this administration. War with Iran would do more than divert attention away from trouble on the home front, it would make it possible for our leaders to blame the ayatollahs for rising inflation and widespread economic dislocation. With the Western world’s interlocking banking system exposed to the imminent bankruptcy of Greece, Spain, Portugal, and Italy, it’s only a matter of time – perhaps sometime this summer – before the whole house of cards collapses. Faced with this inevitability, our rulers have no choice but to switch the blame away from themselves and onto a foreign enemy, one that has been appropriately demonized and set up for the kill. War with Iran – or even the heightened prospect of such an event – would have much the same effect as those falling bank dominoes, albeit on a smaller scale. As the Federal Reserve furiously amps up the printing presses in response to the need for more cash to pay for the bailouts, rising prices can be blamed on those evil Iranians, who, in the process of defending themselves, are blocking the Persian Gulf and driving up the price of oil. Just out of pure spite, you understand…. The powerful Israel lobby, whose instrument in this case is the restless Clintonian wing of the Democratic party, has scotched efforts within the administration to head off a conflict with Iran. This is the price Obama has to pay for his dream of presiding over an Israeli-Palestinian peace agreement – a strategy that ignores the growing militancy of the Israeli body politic, which will not permit a fair settlement, and will do everything possible to undermine the peace process. So why the rush to scotch negotiations and impose sanctions? It’s politics, pure and simple. The question of nuclear proliferation in the Middle East is a serious one: the problem is that no one with any power or influence in the US has dared approach the problem honestly. Any realistic assessment of the situation must include the fact that Israel presently has hundreds of nukes, many of which are no doubt aimed straight at Tehran. This is the real issue, but unfortunately the US government persists in maintaining the fantasy-fiction that Israel is just an innocent bystander in all this. The Israeli government’s official line of “nuclear ambiguity” is not in the least bit ambiguous: they won’t admit to having them because they want the option to use them, at some point. With all their griping and kvetching about how Iran’s nuclear power program represents, for Israel, an “existential threat,” it’s frightening to speculate as to where that point might be located. I can’t emphasize enough how dangerous the present moment is: we are at a critical juncture, with the Lobby pushing hard for war, and the whole political and journalistic Establishment united in beating the war drums loud enough to drown out any and all opposition. Yet the facts are clear, and uncomplicated, and they militate against war – and against getting entangled in what is a regional struggle between Tehran and Tel Aviv. Iran has signed the Nonproliferation Treaty: Israel has pointedly and repeatedly refused. Iran’s nuclear power program, closely monitored by the IAEA, is in compliance with the terms of that treaty, whereas whatever is going on at Dimona no IAEA inspector has ever laid eyes on. The whole world sees this brazen double standard, and our leaders, instead of minimizing it, glory in it. This is what being a hegemon is all about: ensuring and enforcing a gross injustice so unbalanced and arbitrary that only an unchallengeable power could enforce it. This is American supremacism unmasked, politically, and psychologically: naked evil rampaging over the earth, practicing the joys of subjugation –just because we can. The crude rejection of the Brazilian-Turkish-Iranian peace initiative is a clear signal that we are well along on the road to war. Soon we’ll reach the point of no return, but there’s still a chance to stop the War Party. We must appeal to the President directly. Only the President has to power to rein in the warmongers infesting his administration. Not that he’s exactly Mahatma Gandhi, but we have a far better chance of reaching him than we have of deterring Hillary from her ongoing effort to back Iran into a corner. If Obama’s reputation as a political pragmatist reflects the reality, then we have to let him know he’ll pay a very steep price if he allows himself to be stampeded into war. I know it sounds a little pathetic: here we are, mere peasants, going hat in hand to the Czar. But this is an emergency, and at such times it is often necessary to relinquish everything to do with human vanity and concentrate on the big picture: war with Iran would be an absolute disaster. It would be the equivalent of a third world war, a cataclysm whose horrors we can only imagine at present. Please call, and tell him: Not another war, Mr. President! Yes, there’s plenty to do to keep the War Party at bay, and speaking of doing things – yes, there’s something else I want you to do: help put us over the top in our current fundraising drive, which is picking up a bit – but still not enough to ensure our continued survival as a viable project. There’s some good news, however: Antiwar.com has been approached by four “angels” who have agreed to contribute matching funds of up to $20,000 to our fundraising campaign. The bad news is that we don’t have much time to raise those matching funds. We have bills to pay, and they were all due … yesterday. There’s still some time left to avoid disaster, albeit not much, and now we have one last shot at making it. The generosity of some of our more well-heeled supporters gives us a chance to avert disaster – but only if you come through. They’ll match what you give: however that means you have to give, and give now. So please: give as much as you can, as soon as you can. Because nothing less than our survival is at stake.